If Dakar 2019 hadn’t been intense enough, stage eight of the race took the drama to a new level with the race now wide open with just two stages remaining. The biggest shock of the day was when race leader Ricky Brabec was forced to retire from the race just 56km into the timed Special Stage. The heartbroken American ground to a halt when the engine of his Monster Energy Honda expired. 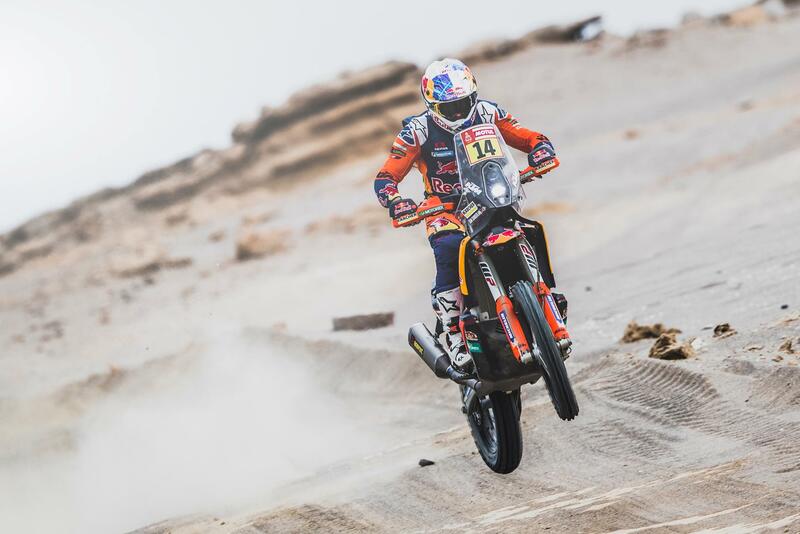 Up until that point Brabec had been the sensation of Dakar 2019 going from a top ten contender in 2018 to champion elect in 2019. It was also the second time Brabec has suffered engine failure on his Honda, he was forced to retire from the race in 2018 on stage 13. With the American out the battle intensified between KTM’s all star line-up of Toby Price, Matthias Walkner and Sam Sunderland, with Husqvarna rider Pablo Quintanilla also firmly in the mix. After a day of intense fighting it was Walkner who came out on top ahead of Quintanilla, Price and Sunderland. It was also a brilliant day for Brit, Sam Sunderland who after an epic performance on stage seven fought his way further in to contention. The KTM man now hold fourth overall 6m 38s off the lead and is well placed for what could be a decisive stage tomorrow. Stage nine of the race will see competitors have to complete a significant 194 mile timed Special Stage.